It was as simple as putting it in the right spot, measuring to make sure it's centered, securing the decal with a piece of masking/painter's tape, rubbing the scraper across the top of the decal, and removing the backing! It sounds like a bunch of steps but was done in under ten minutes! A couple of the fine details on the letters needed a little bit of an extra rub to get the decal in place, but all in all it was super easy! And when it comes time to remove the decal (but why would you?!) it rubs right off with the tool provided! The finished product looks wonderful - especially the contrast between the black and my gray/tan walls. It was true to size to the dimensions on the website and just really looks like it's of high quality. Unfortunately I need to repaint my living room before I put this one up (hopefully this weekend!) Again, the detail came true to size and ;ooks great even in the paper backing! Buy it: Use code FRUGALSHOPPING at checkout to receive 15% off your purchase! 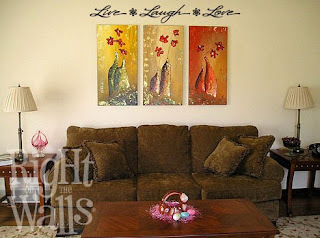 *Tell me which Right On the Walls decal is your favorite! You have until Thursday, April 1 @ 7pm EST to enter! (Winner must respond within 48 hours.) Giveaway open to U.S. residents only. Disclaimer: I was provided with a product sample in order to write this review. All opinions are my own. I love the giraffe growth chart. Would be a perfect addition to our nursery! I would do a custom name one for the nursery! We have been hunting for letters to buy for this purpose, but this wall decall thing looks really cool! I also entered the Yoplait giveaway. i would like one for my daughters' room....either the sister/friends one, or the "be yourself...everyone else is taken"
My favorite is "This kitchen is seasoned with love." Facebook fan of Right on the Walls. Facebook fan of Frugal & Fabulous. I like "music is the voice of the soul"
so much to love!! i really heart the Moon decal!! I love the clock with the established date. I like "If Music Be The Food Of Love Play On ..."
It would look great above the piano! Thanks! I entered the Yoplait gift pack giveaway. I"m a facebook fan of Frugal and Fabulous! I'm a facebook fan of Right On The Walls. in Such A Little Girl"
I entered the Yoplait giveaway! I love "Be One In a Million, Not One Of a Million" for my son's room. Sleep Tight Little One, Like A Bug In A Rug!" I entered the flat iron giveaway! I'm a FB fan of yours! I'm a FB fan of Right on the Walls! I entered the Pink Edition Flat Iron giveaway! I've got your button on my blog! I lvoe the "Love and cook with wild abandon" one!! I like the Live*Laugh*Love one. I really love the Happiness Is Homemade!! The "I Believe In Fairies" would be perfect for my daughter's room! My favorite is the Live Simply • Laugh Often • Love Deeply one! I'm a fan on Facebook of Frugal & Fabulous! i would love one for my daughters room the "BE yOURSELF ONE"
I like Bird on a Branch. I'm a facebook fan of Frugal and Fabulous! under username Jennie Tilson.